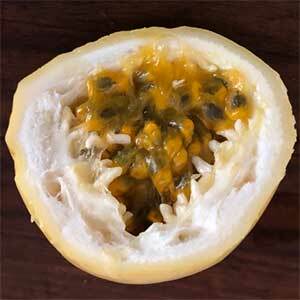 With sweet pulp, the yellow passionfruit is regarded by many as the best tasting varieties of all. This is larger fruited type than the common purple, and thought to a hybrid between the common purple variety, (P. edulis) and the Sweet Granadilla (P. ligularis). It is the taste and fragrance of the pulp that make this such a sought after type. The fragrance is more tropical, sweet tasting with great fragrance make this a real winner. To add to the attraction is the fact that the fruit are large, and in good conditions the vine will produce more prolifically than other varieties. Common names include Panama gold, which is a hybrid, and Liliko’i or Lilikoi. Going by the recognised name of P. edulis f. flavicarpa, this is a fruit that grows best in tropical to sub tropical climates. It requires a humus rich mist yet well drained soil and for fruit quality is best grown on a fence or trellis where it will get best sun and good air circulation. Again for fruit production, protection from strong hot drying winds is preferable. The Yellow Passionfruit is best grown with other varieties, This will help ensure pollination and therefore fruit production. Fruiting period is from late winter through to summer and during this period adequate moisture must be provided. Regular applications of fertiliser will improve production and fruit quality. 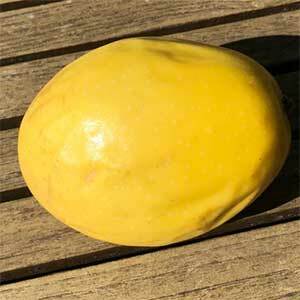 Fruit is picked after the skin colour has changed from green to yellow. This plant is not frost or drought tolerant. The pulp is easy to remove and can be eaten fresh, more often it is used in fruit salads, as a flavouring for ice-cream, on pavlovas and well as a number of other dessert applications.